Seventeen-year-old Beth Risk knows that her mother would face jail if anyone found out the truth about her. She's trying to look after her mother the best she can - until her uncle comes to the rescue. Except Beth doesn't want rescuing, and only goes with her uncle to keep him from exposing her mother. 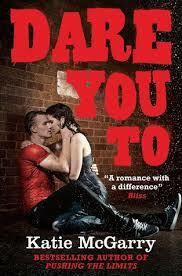 Living with him, she meets town golden boy Ryan Stone, who asks her out on a dare. What starts as an instant dislike on her part, though, turns to attraction, and she finds that Ryan has depths no-one else knows about. Can this mismatched couple help each other to find happiness? Beth and Ryan as narrators weren't as immediately gripping as Echo and Noah were in Pushing the Limits, but by the midway point or so I'd warmed to both of them and was definitely hoping for them to end up together. However, even though this is a really enjoyable read in many ways, it's not quite as good as McGarry's superb first book to me. It falls down on one of Pushing The Limit's strongest points - the portrayal of the adult characters was stunning, and I found all of them intriguing, believable in the way they could be likeable at times and hugely irritating at others. Here, the main adult characters - baseball hero Scott, his new wife, Ryan's parents and Beth's mother - were all extremely hard to warm to. That said, the strong points of the book still far outweigh the week ones - in particular, the chemistry between Ryan and Beth is just as sizzling as that of Echo and Noah was in the first book, while McGarry's plotting is excellent and she weaves together the romance, Ryan's issues with his family, and Beth's problems with her home life brilliantly. Overall, even though I didn't love this in the same way that I fell head over heels for Pushing The Limits, I definitely enjoyed reading it. I'm already eagerly anticipating book three, which focuses on Isaiah, one of my favourite characters. This is a recommended read for fans of teen contemporary novels.